We’re approaching our one-year anniversary on the barge in France. Exactly a year ago, Harvey was rehearsing a U.S. Supreme Court argument. Today he is 3,500 miles from his nearest suit and tie. This is a day to wax philosophical, a day to look back on a year of living mystically, a day to look forward to a summer cruise in which we’re plotting our course by writing down our favorite wines and cheeses, locating the towns where they are made and connecting the dots. 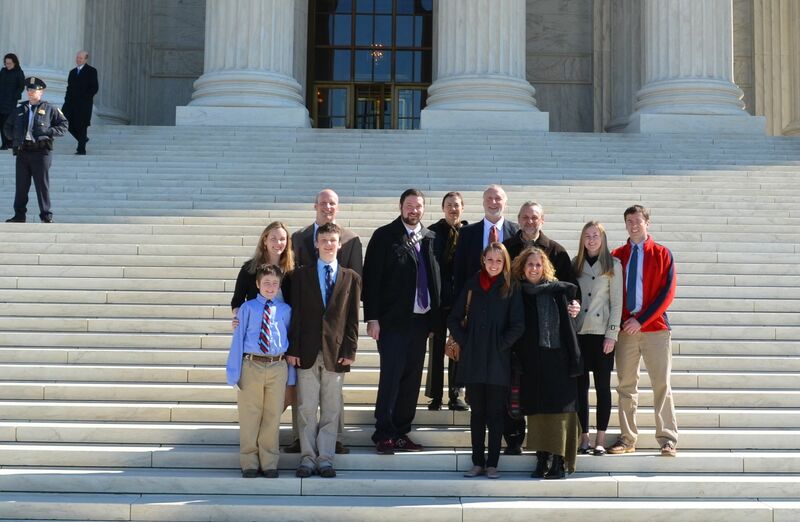 The Schwartz-Hamilton family at the Supreme Court in February 2012, a lifetime ago. 1. John Travolta was correct when he said the French know how to live life. Perhaps it’s because we’re in the countryside – again, life in Paris may be more like living in New York, or Boston – but the people we interact with every day live slower, fuller lives than we are used to at home. It can feel like you are living in 1952. Take Sundays, most any Sunday, even cold rainy Sundays. Sunday lunch takes hours and hours. You sit at a long table jammed with people, old people, young people, children, even a dog or two. Course after course is served. Bottle after bottle is poured. 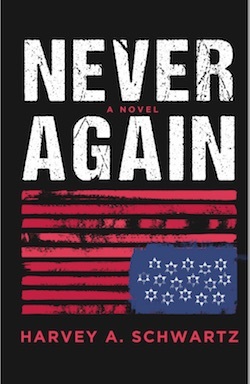 It seems chaotic but follows a pattern and a pace that has been repeated for centuries. Sunday lunch ends with a promenade, a walk, for us this winter a walk along the River Saone, a walk with hundreds of other people, elderly couples with canes and walkers, elderly couples on bicycles, young families with children on bikes with training wheels, lovers stopping every three steps to kiss while people walk past them on both sides, old women walking tiny dogs on short leashes, young men with large dogs, unleashed, magnetically attached to their heels, men with three-piece suits wearing berets, teenagers dressed in full “NYC” regalia – baseball caps, high school jackets, long baggy shorts, all plastered with random English words – and a couple of Americans taking in the scene, greeting and being greeted with “monsieur-dame” by every couple they pass. 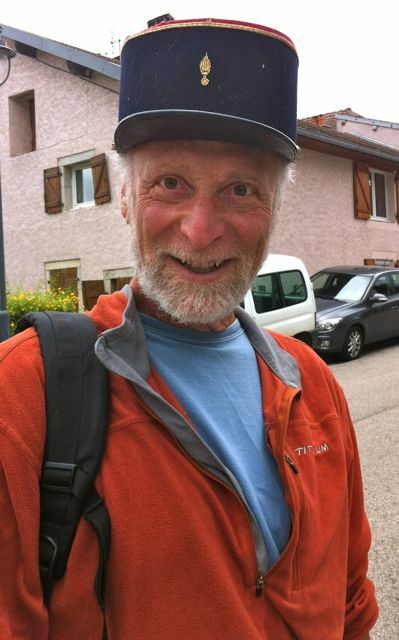 Sandra refused to allow Harvey to buy this kepi, a French military hat, at a vide grenier, an “empty attic” sale. Once again, wisdom prevailed over silliness. Another example, buying a chicken. Most Fridays, we buy a roasted chicken from the poulet roti man, a friendly fellow who parks his truck between the church and the Napoleon statue every Friday morning. 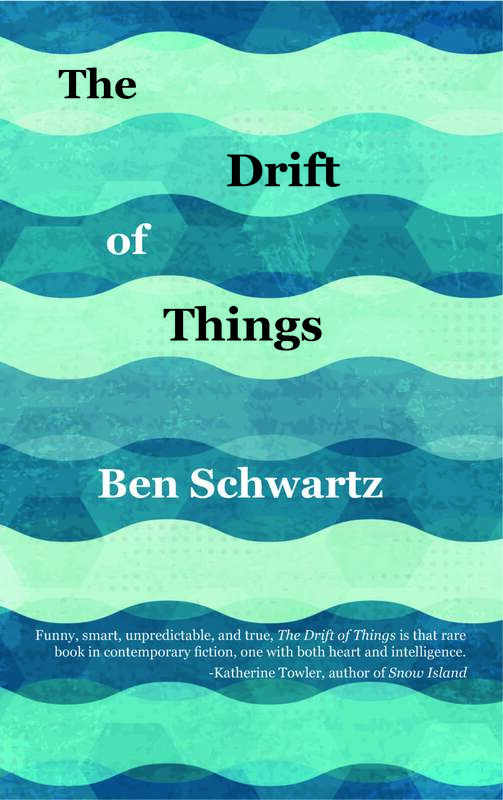 He lifts the side panel to reveal rows of chickens, ducks, quail and an assortment of most bird watchers’ life lists slowly revolving in front of heating coils, the juice from the upper ones dripping onto the lower ones, and down to the potatoes at the bottom. He also sells a soft sourdough bread in meter-long loafs; you spread your hands to show how much bread you want and pay by weight. Once you reach the head of the line, buying a chicken and chunk of bread takes ten minutes of chatting. Last week he offered to sharpen Sandra’s kitchen knives. He had to tell every customer behind us that when he asked if we wanted potatoes, Harvey said oui and Sandra said no. Nobody complained about how slowly the line moved, instead they laughed along with us. 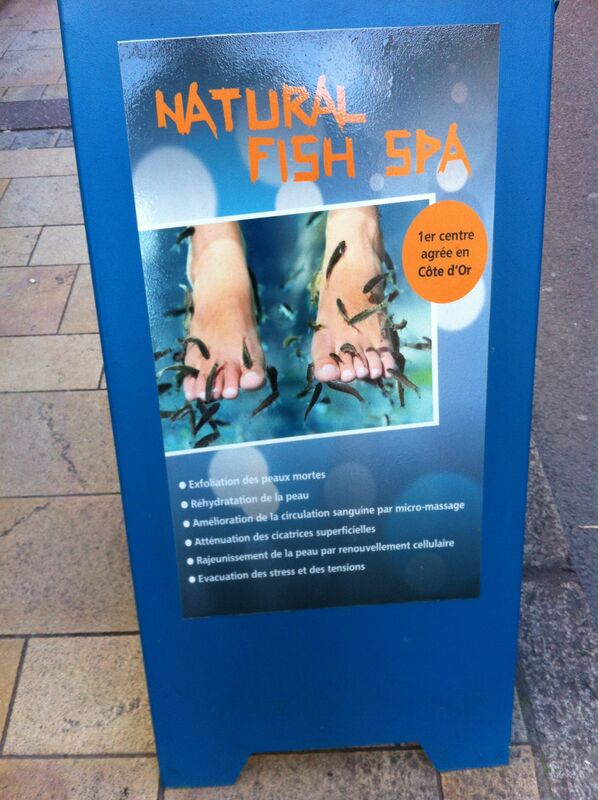 The Dijon “fish spa” where piranha-like fish chew dead skin. Perhaps not the high point of French medicine. B. It hasn’t all been foie gras and fabulous friends, though. Some days, winter days, are cold and dreary. An 87-year-old former commercial boat does not hum like a factory fresh Mercedes. Hoop Doet Leven is more like a moderately healthy but increasingly aging old man. Its stomach rumbles and it isn’t as agile as in younger days. Strange noises are heard in the middle of the night, elderly iron creaking and, hopefully, not cracking. Pumps that don’t pump. Hoses and clamps sagging, losing their grips, just saying no. The toilet moans. Drips drop. It rains inside the bedroom as an evening’s exhalations condense on cold iron ceilings. Most every day has a list, a shopping list and a fix-it list. iii. Giving each other space while living in a confined space is vital. One of the gifts of this adventure has been having a shared adventure. So much of our past twenty years together has been spent doing our own things, following our individual passions at separate jobs and separate activities at home. This experience has been a shared one, learning to live in France, learning to live on a boat, learning to handle the boat together as a crew. 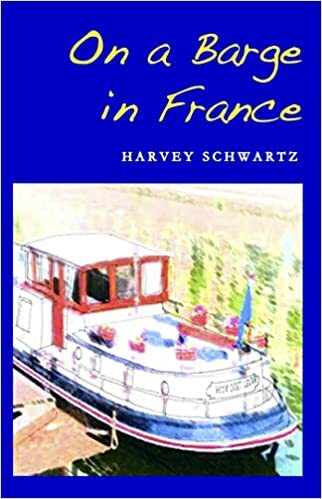 We have our assigned and/or default roles, Harvey nurses the boat’s systems, Sandra is our ambassador to the French. Yet so much of the vast amount of effort it takes to make this whole endeavor work is joint effort, planning our routes, operating the boat, and the sheer physical labor of living without cars. We’ve come to depend on each other’s skills and competency. The counterpoint is that we recognize we’re each going to have a bad day from time to time and we each need to get away, physically or emotionally, once in a while. (Harvey is off to a British boat this afternoon to watch England play France in Rugby, an exercise, we’re told, that involves vast quantities of single malt scotch.) Despite almost twenty years of marriage (this September) sharing this adventure and living so closely brought a new intensity to the relationship. d. What a wonder-filled year it has been to wake each day not knowing what challenge or accomplishment awaits but confident that something is lurking. 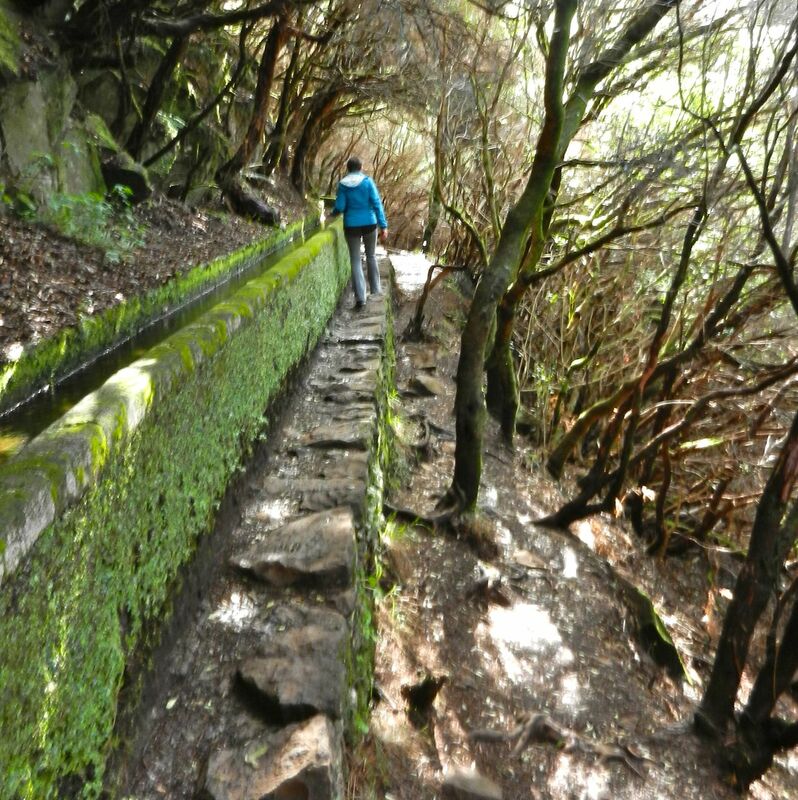 A “levada” walk on the hilly island of Madeira where we escaped French winter. These canals carry water from the mountains to farms and gardens and provide hiking trails throughout the island. Not being European Union citizens, we are allowed to remain in France for more than a three month visit by the granting of a carte de sejour, a one-year residency permit. The procedure for applying for the carte de sejour was Byzantine. We had to deliver a collection of forms in person at the French consulate in Boston. After an interview there, we received beautiful holographic stamps filling a page of our passports. Had we waited until we’d arrived in France we would have been sent back to Boston to apply. Immediately after arriving in France we had to submit the exact same forms again and, following X-rays, a non-physical physical examination and another interview in Nancy, our passports were again holographically stamped with one-year residency permits on the page following the original one. Now, a year later, we dreaded the renewal process at the local marie, the Auxonne town hall. Fortunately, this interview was an exercise of Rule Number Three. For example, our medical insurance certification, proving we had the mandatory coverage to pay to ship our remains out of France should we die here, so as not to despoil French soil with our corpses, had been mailed to our son Ben in New Hampshire, our token mailing address. He’d scanned the certification and emailed it to us. But you must present the original, we were told at the marie. Sandra smiled and chatted about our vacation on the Cote d’Azur, all in her best – which is pretty good by now – French. She pointed out that the clerk’s boots were unlaced and prayed she would not trip on them. The woman smiled and – voila – with a swipe of her Rule Number Three rubber stamp, the copy became acceptable. French banks, however, are bastions of Rules Number One and Two. Banks here don’t hand out toasters and gift certificates to new customers. No, French banks are more like Mr. Grumpy’s house on Halloween night, porch lights are turned off and the house dark so trick or treaters will be lured into believing nobody is home. Trying to deposit a check to your bank account makes you feel as if you are disposing of your collection of doggie poop bags. And don’t ask for change. They don’t have any, at least not today. The ATM may dispense fifty-euro notes, but no bank teller can change them to any size bill that any French store keeper will accept. We have a phone number that supposedly rings through to our special personal bank representative at the HSBC branch on the Avenue des Champs-Élysées in Paris. He will solve any problem we might have, the bank promised us. When Sandra dialed his number yesterday a recording told her, in French, it was no longer in service. V. Food, everything you’ve heard about French food is true. 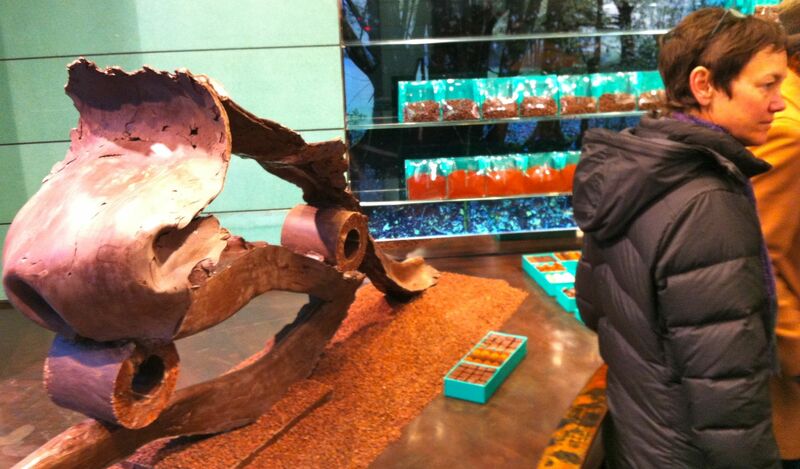 In Paris we dropped in at the shop of master chocolate maker Patrick Roger. He is one of the few chocolatiers to receive the title of Meilleur Ouvrir de France (“Best Craftsmen of France”), a government competition to anoint the masters of various trades, from locksmithing to hair styling to blacksmithing to – yes, chocolate making. (Just imagine, for a moment, the pyrotechnics that would be ignited if President Obama proposed that the government select the best chocolate maker, or plumber, in the United States.) Entering the competition costs around 50,000 euros and few people win their first try. He did. After tasting a saffron and basil chocolate he’d made, Snickers bars are a thing of the past. Chocolate sculpture at Patrick Rogers in Paris. We’ll never eat a Snickers again. At the other extreme, snapping the tip off a baguette (the single mouthful one is permitted – another Rule Number One – to eat on the street is called the “crouton”) baked within the half hour and still warm, from almost any local boulangerie is as mouth satisfying as food can be. A baba au rhum dessert at a buchon – a small, working persons’ lunch restaurant – in Lyon, which is acknowledged as the food capital of France, meaning, of the entire Universe, was simply a cake and a bottle of sweetened rum you poured over the cake. Sure, food is serious business pretty much everywhere. The difference between everyday food in France and in the States, though, is that the concepts of supersizing, bottomless coffee cups and enough food to require a take-home bag, concepts that have positive connotations at home, are replaced in France with a struggle toward excellence, toward quality, tradition, simply toward fineness. Appreciation for good food is taught in school, and at home. You see two butcher shops side by side, but one has a line out to the sidewalk, the other is empty. People search for quality, rather than quantity, in their food. It goes on and on. This year has been a gift we’ve given to ourselves. Best of all, we appreciate what we’ve done. But it happened only because we consciously chose to make it happen and went through intensive efforts to bring it about. Back in lawyering days, negotiations and mediations were a large part of the litigation repertoire. One rule of negotiating was to consider your BATNA, your Best Alternative to a Negotiated Agreement, meaning, if you fail to compromise, what happens next and will that be better or worse for you than a compromise agreement. We think about our BATNA to this time in France. How would this past year have been had we stayed home. And what would next year be like if we called quits to this adventure? Looked at that way, the choice is simple. France – sometimes cold, sometimes dreary, sometimes frustrating, sometime just simply exhausting – gives us a life more stimulating, more fulfilling, more exciting than remaining at home would have. Moments of doubt have been few and effervescent. The counterpoint to this is our frustration when friends at home say they are living vicariously through us. That is more responsibility than we want. Go ahead and rely on us as pathfinders, as scouts, but please don’t live vicariously through us. As Jerry Rubin, our Yippee leader, told us in the 1960s, “do it” – not necessarily a barge in France, but whatever blows your own whistle – for yourself. FINAL NOTE – Thanks to everybody who wrote with concerns about Harvey’s health. After adjustments to his medication and bread levels, everything is, to use a favorite French response, c’est normale. I would go back and buy the hat. It would be most interesting when worn at a monster breakfast. But, it may violate Rule #1. At any rate remember rule #4. “If it moves and shouldn’t use duct tape and if it doesn’t move and should use WD-40”. Out. So it was John Travolta who first said that the French really knew how to live. I wasn’t aware of that! That Travolta, he really knows how to turn a phrase.